The Rotary Club of Conifer is a volunteer service organization that identifies and supports causes which improve the quality of life for fellow humans & their environments. Please join us weekly every Tuesday at 7am at the Mountain Resource Center or at 5:30pm every second and fourth Wednesday of the month at St. Laurence Episcopal Church. The time has arrived once again for our Annual Peach Sale Fundraiser! If you haven't ordered from us before, please download the order form posted here: https://mymountaintown.com/forum/194-area-non-profits-service-organizations/329965-rotary-club-of-conifer-annual-peach-sale-orders-due-by-august-4th and mail it to P.O. Box 1430, Conifer, CO 80433 along with your check made out to Rotary Club of Conifer. If you have ordered from us before, simply call Angela at the number below and tell her how many cases you'd like, then mail your payment in by Aug 4th. The cost is $35.00 per box of delicious peaches. Complete orders, with payment, must be received by August 4, 2017. Peaches will be available for pick-up on August 18, 2017 in front of Mountain Books at the Aspen Park Village Center, 25797 Conifer Rd, Conifer from 9:00a.m. to 5:00p.m. Any peaches not picked up will be donated to local care centers. If you have any questions, please call Angela at 303-838-6755. All proceeds from this sale benefit the community service projects sponsored by the Rotary Club of Conifer. Thank you for helping to support the Rotary Club of Conifer! It's time for our Annual Peach Sale! Please use the order form posted here: https://mymountaintown.com/forum/139-the-campfire/328057-rotary-club-of-conifer-annual-peach-sale-orders-due-by-august-10-2016 to order your peaches. Complete orders, with payment, must be received by August 10, 2016. Peaches will be available for pick-up on August 26, 2016 in front of Mountain Books at the Aspen Park Village Center, 25797 Conifer Rd, Conifer from 9:00-5:00. Any peaches not picked up will be donated to local care centers. All proceeds from this sale benefit the community service projects sponsored by the Rotary Club of Conifer. Please make checks payable to Rotary Club of Conifer and mail to P.O. Box 1430, Conifer, CO 80433. If you have any questions, please call Angela at 303-838-6755. The Rotary Club of Conifer is a volunteer service organization that identifies and supports causes that improve the quality of life for people and their environments locally and internationally. We are one of more than 32,000 clubs and 1.2 million men and women world-wide that make up Rotary International. Our annual events include the Mountain Area Home & Garden Show, the Peach Sale, and the Mountain Area BBQ Challenge. The 10th Annual Mountain Area Home & Garden Show is happening on April 25-26, 2015 at Conifer High School. 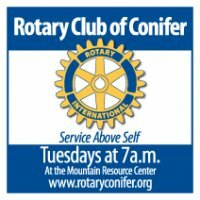 Our Conifer Rotary club meets weekly on Tuesdays, 7am at the Mountain Resource Center for breakfast to learn about a variety of service vocations, to organize and plan our service goals and to engage each other as friends and colleagues. Our annual events include the Mountain Area Home & Garden Show and the Peach Sale.